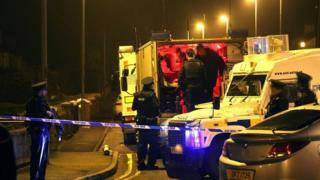 A number of homes have been evacuated in Rasharkin, County Antrim, due to a security alert. Police said they received reports that suspicious objects had been found at two homes in Moneyleck Park at about 22:00 BST. Sinn Féin MLA Philip McGuigan said more than 20 homes in Moneyleck Park and on Finvoy Road had been evacuated. Arrangements are being made to provide emergency shelter, police have said.